History: (Scarlet Spider Unlimited#1 (fb)) - The High Evolutionary dispatched the Animen to a laboratory operated by his former assistant Miles Warren (the Jackal) to clean up his files. They found the body of Kaine, a clone of Spider-Man, lying within a chamber in the Jackal's lair, but left him alone. (Scarlet Spider Unlimited#1) - After three weeks, the Animen were almost done with their cleanup and had spread a virus into all of Warren's files, but they were discovered by Jacob Raven, a police investigator. Spinneret webbed him up, but he was followed by the Scarlet Spider, who fought the Animen. 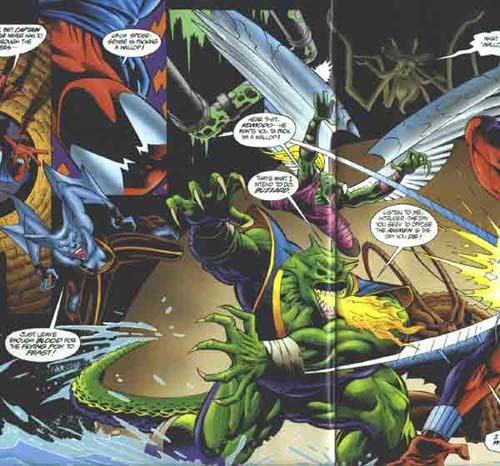 When the High Evolutionary teleported the Animen back to Wundagore, the Scarlet Spider was accidentally brought with them, having stuck himself to Crushtacean with his webbing. Later, the Scarlet Spider joined members of the Cult of the Jackal in sneaking into the citadel of the High Evolutionary in an attempt to learn the truth about Warren's involvement with the High Evolutionary. The Animen came to face the cult members and Scarlet Spider, but the fight was brought to an end after the Scarlet Spider was able to learn the truth from the High Evolutionary. The High Evolutionary sent the Scarlet Spider home, but Crushtacean foolishly touched a ball of impact webbing the hero had left behind, covering himself and the other Animen with webbing, much to their embarrassment. Comments: Created by Glenn Herdling, Tod Smith and John Nyberg. 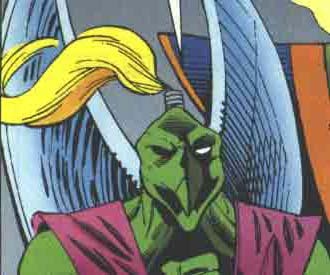 Buzzard was a New Men evolved by the High Evolutionary from a hawk. He accompanied the Animen on their clean-up mission at the Jackal's laboratory and fought the Scarlet Spider. Later, he fought Harrier of the Cult of the Jackal when their members infiltrated the High Evolutionary's citadel, but the High Evolutionary brought the fight to an end. Buzzard possesses wings enabling him to fly, and has sharp pieces of metal attached to his wings. 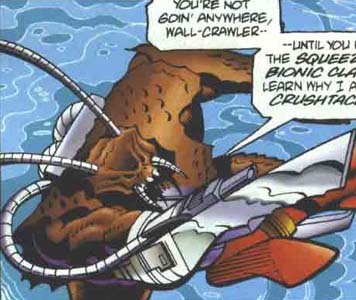 Crushtacean was a New Men evolved by the High Evolutionary from a crab. He accompanied the Animen on their clean-up mission at the Jackal's laboratory and fought the Scarlet Spider, accidentally bringing the hero back to Wundagore with them when he was webbed to one of his pincers. Later, he fought Piranis of the Cult of the Jackal when their members infiltrated the High Evolutionary's citadel, but the High Evolutionary brought the fight to an end. Afterwards, Crushtacean accidentally set off the Scarlet Spider's impact webbing, covering himself and his fellow Animen with webbing. Crushtacean possesses a hard shell protecting him from harm, powerful bionic pincers in place of hands, and wields an Atomic Steed while in Wundagore. His antennae are not covered by his shell, making them an easy target to an opponent. 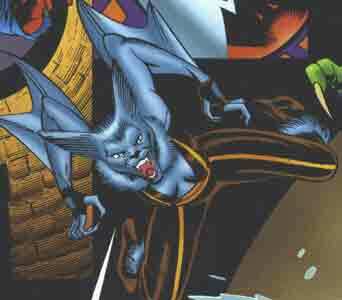 The Flying Fox was a New Men evolved by the High Evolutionary from a bat. She accompanied the Animen on their clean-up mission at the Jackal's laboratory and fought the Scarlet Spider, biting him in the neck during their clash. Later, she fought Piranis and Caiman of the Cult of the Jackal when their members infiltrated the High Evolutionary's citadel, but the High Evolutionary brought the fight to an end. The Flying Fox possesses wings enabling her to fly and sharp teeth. 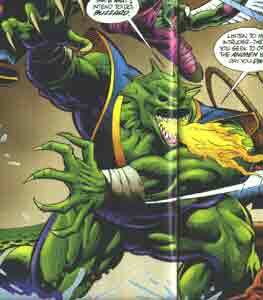 Komodo was a New Men evolved by the High Evolutionary from a lizard. He accompanied the Animen on their clean-up mission at the Jackal's laboratory and fought the Scarlet Spider. Later, he fought Caiman of the Cult of the Jackal when their members infiltrated the High Evolutionary's citadel, but the High Evolutionary brought the fight to an end. Komodo possesses a strong, scaly hide, enhanced strength, the ability to breathe flame, and a powerful tail which he can use in combat. While in Wundagore, he flew an Atomic Steed. 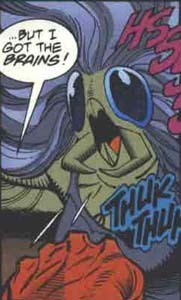 Spinneret was a New Men evolved by the High Evolutionary from a spider. She accompanied the Animen on their clean-up mission at the Jackal's laboratory and fought the Scarlet Spider. Later, she fought the Scarlet Spider and the Cult of the Jackal when their members infiltrated the High Evolutionary's citadel, but the High Evolutionary brought the fight to an end. Spinneret possesses the ability to encase her enemies within cocoons made from her own organic webbing.